Great news! OG’s Speculative Fiction, Issue 23 has been released! In Lawrence Dagstine’s “My Own Private Earth” two brothers game for toy planets that are far more than toy planets while two other brothers struggle to escape the Germans in WWII. Wayne Helge’s “Voyeurs” will tempt you to believe that a toy model of Chicago can come to life. 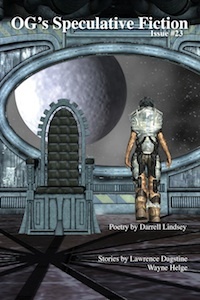 Also included is poetry by Darrell Lindsey. Let us know what you think of the issue! Don’t miss our other issues of OG’s Speculative Fiction if you haven’t read them. Seth, great issue once again. Very proud to be part of it. I feel extremely outclassed by the great writers you always attract. Well done!